This recipe has a crazy long name, doesn’t it? 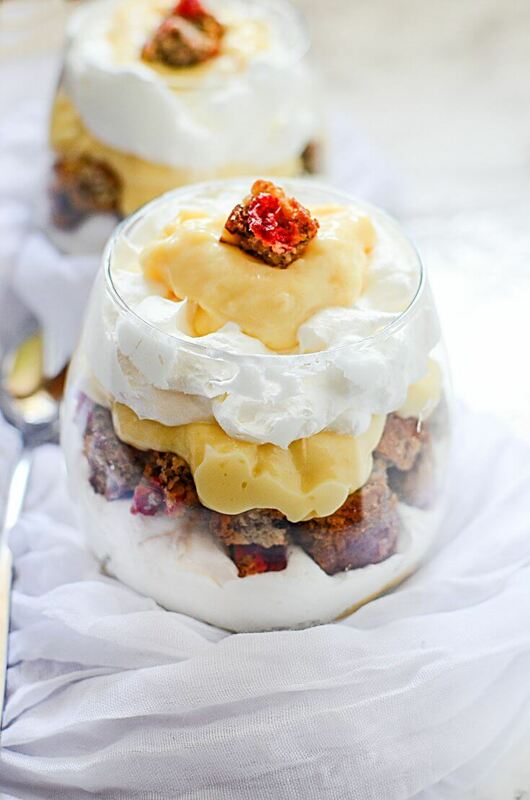 Easy Banana Bread Dessert Parfait Recipe. 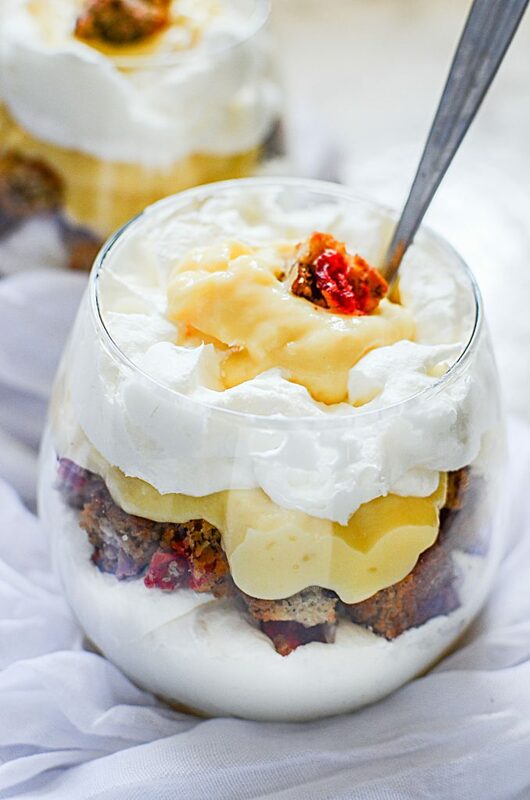 You wanna know what else is crazy about this easy banana bread parfait? 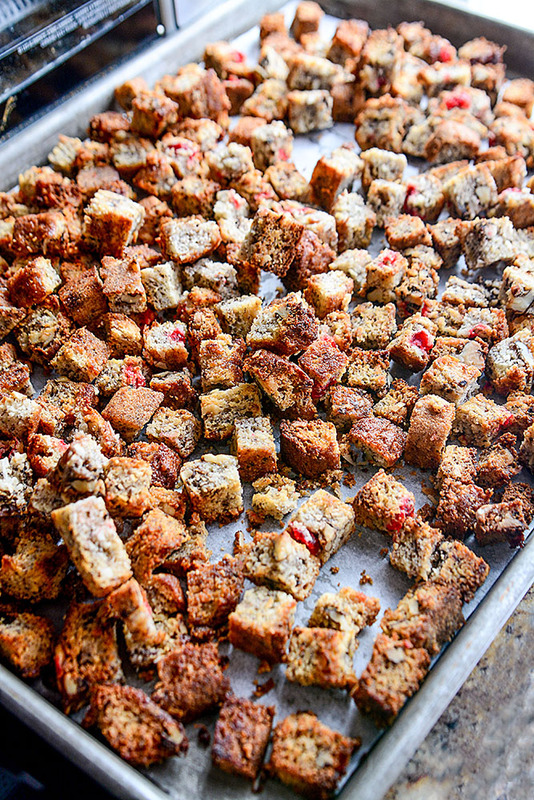 It uses BANANA BREAD CROUTONS. Yes, I know. I had never heard of them either until I made them!! It started one day when my aunt had called me up. She had made a special banana bread recipe that included coconut and cherries in it. Let me tell you folks, this recipe for banana bread is simply amazing. It’s not my recipe (or my aunt’s for that matter), but if you click on the blue colored “banana bread recipe” link in the sentance above, you can use that one, or you can use your own very special banana loaf recipe. Basically, you want to use any left over banana bread you might have. So she had a some left and wanted to know if I wanted any. I said sure, bring it on over. I had a slice or two, and because there were A LOT of treats in my house at the time, I didn’t want her bread to go bad. So, I cut it into slices, and then into “croutons”, and put them into the oven to dry out and toast. I know, it sounds crazy right? I didn’t know what I was going to make with them, so I put them in freezer for a few days while I got onto other things. Then, later in the week, I was walking by the fruit bowl in the kitchen and realized that two of the bananas were pretty ripe. Not gross ripe, like, all brown and mushy, but ripe that they would be perfect for the last day of eating, just before the turned into perfect banana bread ingredients. Ah! 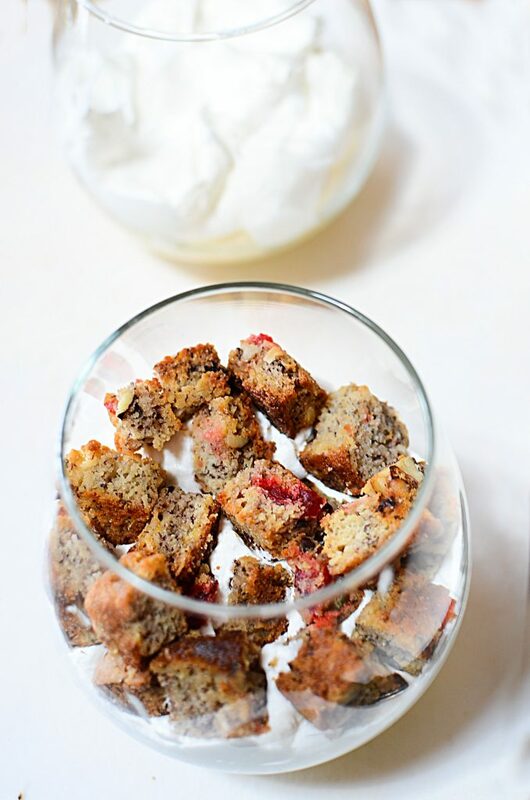 I remembered – I had those croutons in the freezer from my aunts banana bread recipe! If you use a cook and serve banana pudding, be sure it cools down and sets up properly before using so it doesn’t melt the other ingredients it comes in contact with. Ok, let’s get on with the recipe! Slice the banana bread into cubes and either let them air dry over a day or so, or you can toast them in the oven. I preferred to toast them as they add a bit extra “toasty” flavor, and it makes the process of making this dessert that much faster to eat! Bake them in the oven at 350 for about 5 minutes. Check them for their toastiness. You don’t want them dry like cement rocks, but you do want them nice and crispy. Prepare your banana pudding. Allow the pudding to set up before you begin the assembly, so chill it for about an hour or so. If you want to whip your own topping, do so while the pudding is chilling. Once chilled, the assembly can begin. Place some pudding at the bottom of the parfait glass. Next, place the sliced bananas on top of the pudding. Next, place a layer of whipped cream on top of the bananas and then place some of the banana bread croutons on top of that. 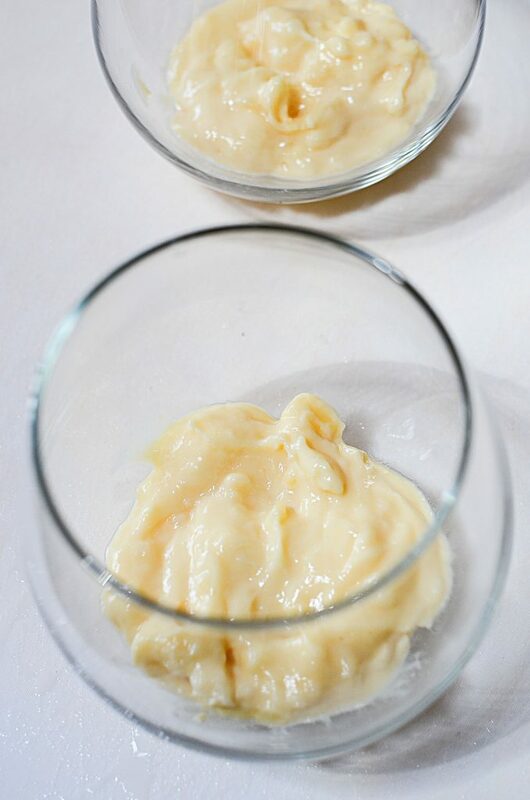 After that, it’s a simple continuous layering technique until you finish all your ingredients, or that the parfait glass is full. 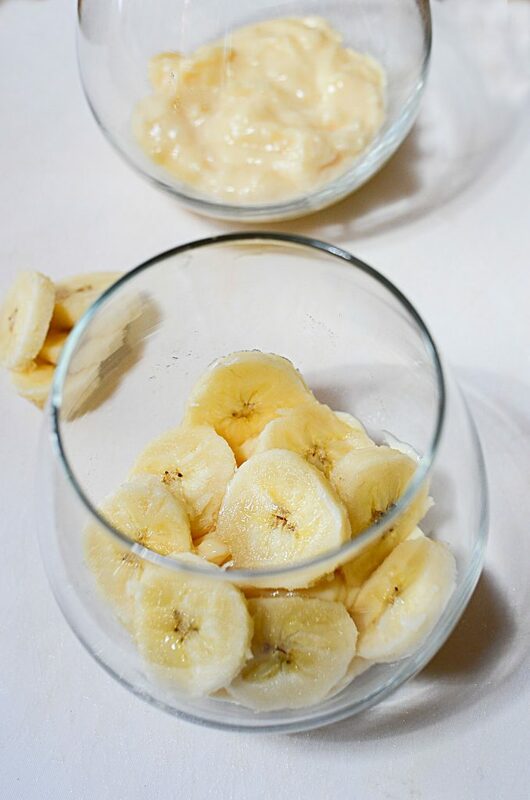 See how simple it is to make this easy banana bread dessert parfait?? The best part of it is that you can customize this dessert parfait in any way you wish in terms of amounts. So if you want more pudding in each dessert, use more for each layer! More of the croutons? Use more! The only thing I would suggest is that you use a nice crouton or two for garnish on the very top! 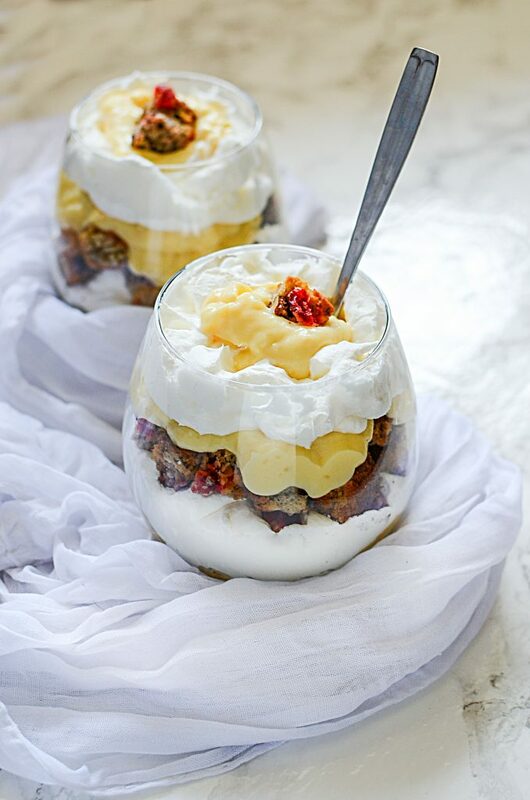 If you like this easy banana bread dessert parfait and other desserts with fruit, or desserts with layers (like trifles), check out these other recipes while your here that you might enjoy! Apples are the star with this Apple Pecan Croissant dessert with Butterscotch Schnapps Sauce sauce (click on the colored link), and this fantastic Marshmallow Birthday (or any time) Cookie Trifle is a sure hit! Both of them are very simple and super easy to put together – because you know me, I’m all about the simple! 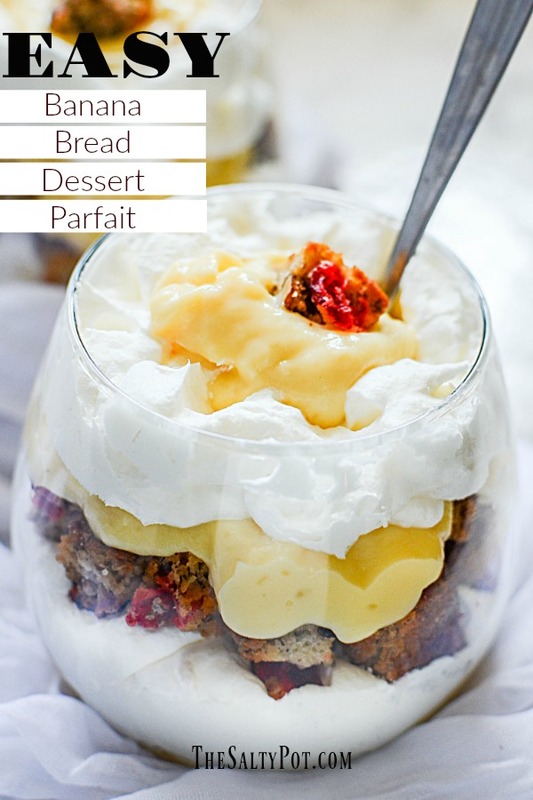 Simple and Easy banana loaf parfait dessert. 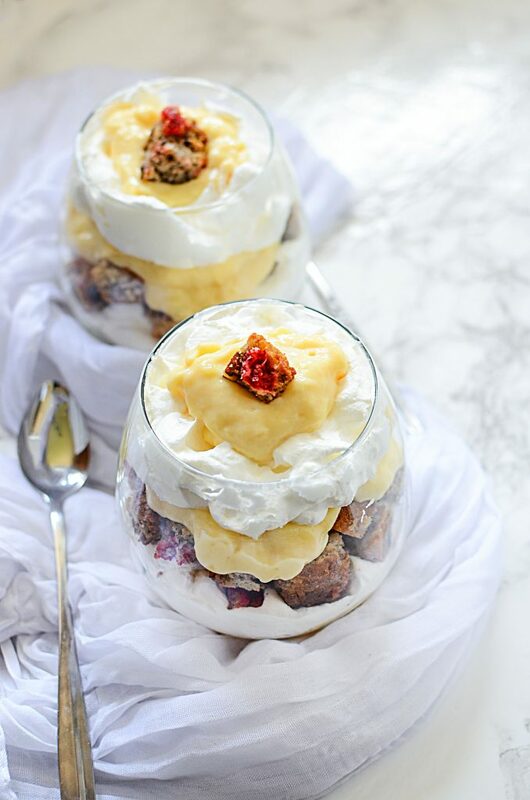 This easy Banana bread parfait is a perfect put together dessert recipe that comes together quickly and looks heavenly. Plus it's a great way to use up left over banana bread! Prepare the banana pudding and whipped topping. Being the assembly of the ingredients. Place a layer of banana pudding at the bottom of the parfait glassLayer some bananas on top of the puddingLayer some whipped topping on top of the bananasSprinkle some banana croutons on top of the whipped toppingcontinue layering until you reach the top with whipped topping.Garnish with a few banana bread croutons. Enjoy! « SIMPLE AND SUPER EASY ITALIAN SLIDER RECIPE! !